sitting here looking at the clock and knowing that in two hours the year of 2010 will come to and end. All the joys, all the sadness, the ups and downs and everything in between will stop and a new year full of expectations, dreams and goals will begin. There's been really good times and unfortunately the year has ended on a sad note for my family. Without going into details, I would appreciate any prayers that could be said for our family, for help, for guidance and for strength. With that said, as I think about the New Year, my heart is filled with joy at the prospect of what may be waiting for us, of what is ahead, of what we will see and do and achieve. Instead of worrying about what I don't know, I look forward to the future. I hope that 2011 brings you nothing but happiness, joy, health and all that you ever wished for. Now here's a quick review at this past year. 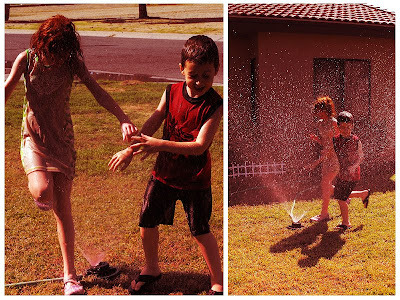 We are but a few days away from a big change in our lives, the beginning of a homeschooling journey. Our study area is all set up and ready to go. To say that we are excited is but an understatement but mixed in with the feelings of excitement is also some fear on MY part. The kids are unaware that I'm even worried a tiny little bit. Well, because it's such a huge undertaking and such a huge responsibility as a parent. We try so hard to do what is best for our children and we never want to in any way impede their development, so taking on the task of teaching and being in charge of their education is something that brings me a little anxiety. I know I can do it, I have no doubt that I can do it, but will I do it right is the big question, and I know I'm not the only one to ever have these feelings as I'm sure it's pretty common when a family first begins their homeschooling journey. One of the things that really struck me when I received Nicholas' school materials is that up until this point I really did have no clue what they were doing at school and what they were using to learn. It's quite a scary concept to realize that so much of your child's education and well being is placed upon the hands of teachers who you really don't know from a bar of soap. 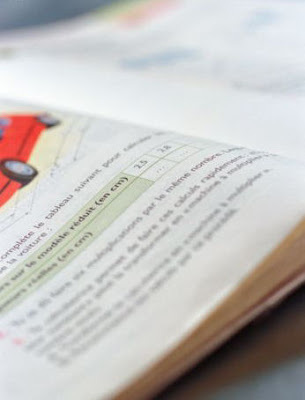 Often times I felt like I had no idea where my children were in their studies, it just feels as if over the years the schools have disconnected more and more from the families and have tried to create their own little world where parents are just not welcome. On the one hand, they want your input and help and on the other hand they are constantly putting up barriers and keeping us from being TOO involved in what they are doing. Knowing that I am going to have first hand access to what goes into their little minds is so thrilling. It's a change, a huge change for us and until we find our footing we may stumble about here and there. I like to think of it as a learning opportunity for us all, what works, what doesn't, what schedule best suits us, what are my children's strongest subjects, what are their weakest, who is a visual learner and who is more hands on etc etc. I do plan on taking you all along with us as we step into the unknown and you may from time to time find me whining or complaining or begging for help from the seasoned homeschooling mama's. I have a small request to make, with school starting next week I still don't have a Christian curriculum set up for the children, I have looked through all the ones you suggested and even got some catalogs in the mail....but to begin, I would like some links to something I can print and use right away. Any suggestions? Could you give me an idea of how your homeschooling day goes, do you start with prayer or do you leave the Christian learning for the end of the day? As I've said many times before, Crocheting is extremely therapeutic for me and right now I'm going through some family issues that have me needing some relaxation and something to keep my mind off the stresses. I've found myself crocheting every single day, pretty much making a project a day and I am loving it. This next project is one that I've seen floating around and have wanted to try for a while, I think what first drew me to it aside from the fact that it's gorgeous, is the fact that it's from South Africa and was first featured in Afrikaans in one of the South African magazines, Sarie. Someone already translated it so I didn't have to do it for you guys, thankfully cause I'm afraid I would have messed something up and not done the pattern justice. Super Super quick to make and they turn out just beautiful. 1st Round: Chain 5 stitches and join with slip stitch to form a ring. 2nd Round: Chain 3 (count as first dc), 1 dc in ring, (1 chain stitch, 2 db in ring) 5 times, 1 chain stitch, join with slip stitch to first dc (6 shells). 3rd Round: Join next colour and crochet in each of the 6 chain spaces: (2 dc, 1 chain stitch, 2dc). Join with slip stitch to first dc. 4th Round: Join next colour and crochet 7 dc in each of the 5 chain spaces. Join with slip stitch to first dc. 5th Round: Join next colour and crochet 1 sc in each of the next 7 dc, except between the 2 dc of the third row where you do a dc which you join to the 3rd round in order to form the petal - (7 sc and 1 dc) 6 times. 6th Round: Join next colour and crochet 1 dc in each sc, except for the middle of each petal where you crochet (1 dc,1 sc, 1dc) in each petal. Tie off. If you're more of a visual person, then I would suggest following Heidi's tutorial which can be found here. Very helpful! Now the directions I'm giving you are JUST for the inside flower, the rest of the pattern comes from Crochet with Raymond, she turned these into Potholders, so just follow her directions for that. Cloudy and 46 degrees, we're supposed to get more rain this week. Doing housework or yard work with my family, we always make it fun. Nothing at the moment but I did receive a new one for review which I need to read. Finish cleaning and getting the house back in order after the holidays. Also working on getting Jasmine's homeschooling computer set up. Relaxing with my husband and kids, getting ready for homeschooling next week. I am drawing a complete blank, honestly can't think of a single tip to share. Was terribly sick this past week and really didn't get to do any blog reading. That I'm not omnipotent, that I can't DO everything and most of all, that I'm not invulnerable. Being really sick to the point of having to stay in bed for two days really does make you stop and think. We take our health for granted, we don't ever really think about it because we feel fine but when you're knocked off your feet you immediately thank the Lord for all the healthy days you have. Homeschooling and I know I have been saying that a lot, but truly, we can't wait. The creative juices have been flowing here at home and all because I've been so under the weather. Truthfully, I don't like being sick I'm a very impatient person when it comes to that, I find it a nuisance and get frustrated because I have no time to be sick. How ridiculous is that? Anyway, I've got a few projects going on but one I had my eye on for quite a while and just couldn't wait any longer. I kept seeing these beautiful Granny Mandalas popping up all over the place, matter of fact you can find quite a few stunning ones on Flickr. In my mind I was thinking that it would be quite intricate and I may just not be able to get it done, but boy was I wrong and I LOVE when I'm proven wrong. 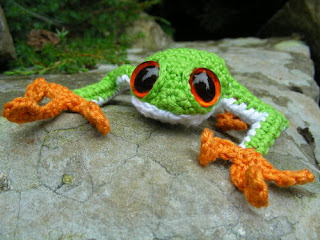 I found and totally fell in love with a new blog, well new to me, called Crochet with Raymond. Oh the goodies this woman makes has me salivating and dreaming of colors and yarns and crochet hooks. 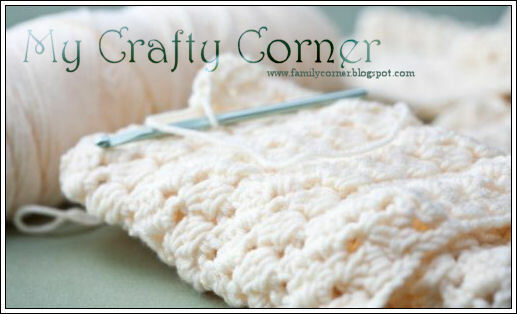 The pattern I followed can be found at Alice's blog. 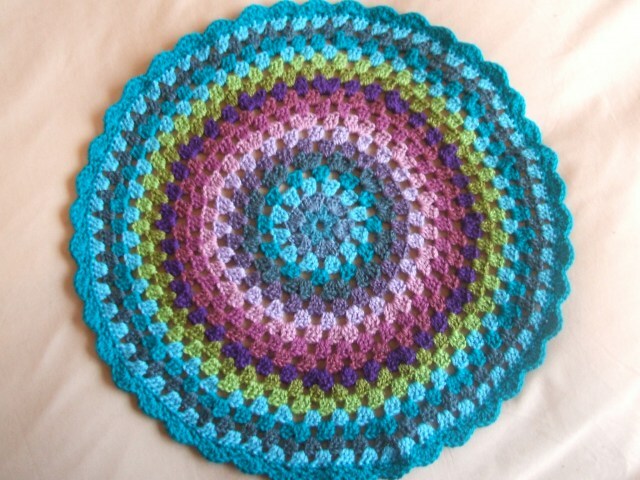 Now mind you I followed her very first Granny Mandala Tutorial BUT my next one I'm following her update version which is here. I'm giving you both and you can decide which to make, or try one of each? I didn't make mine as big as Alice's, matter of fact I finished it off a few rounds before and I also did my color changing a little different. You can see that I did 3 rounds of the mint green at one point, just because I absolutely love the pastel color and wanted more of it in. 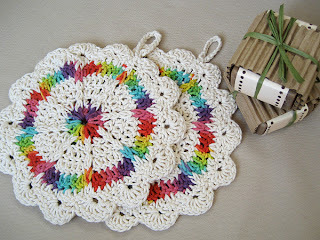 It's up to you, the whole point of these Mandalas is to have fun and use whatever color strikes your fancy. I lay gladwrap on my carpet in a sunny spot and wet the mandalas, then pin them to the carpet gently stretching them out to their full size and leave to dry! Enjoy and if you do make one or a few, won't you come back and show me? You've probably been wondering where I've been and unless you follow me on Facebook you wouldn't know, but I have been extremely sick this past week. It started with a full blown cold with body aches and fevers and on Thursday morning it turned into a stomach bug which had me in bed until this morning. When I say that I was sick, I mean I.WAS.SICK. I have never felt so horrible in my life, I've lost 5 lbs just in two days which is a lot. 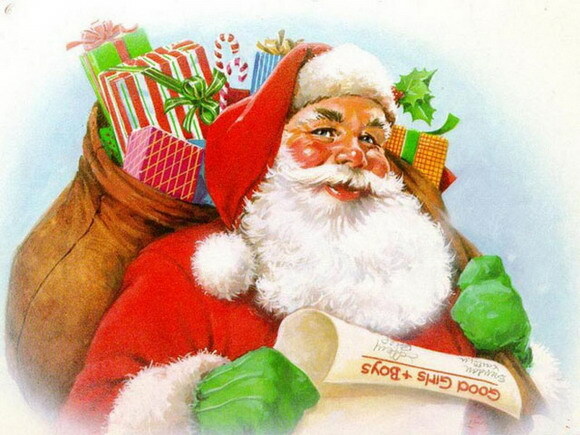 But enough about me, I am starting to feel a little better and wanted to come in and wish all my family, friends and blog readers the merriest of Christmases and a Blessed New Year. I have so much to be thankful for this past year and I only hope that the new year will bring me as many joys and blessings as this one did. To all my faithful blog readers, a huge thank you for all the comments and for your continued support, you inspire me to continue on this blogging journey. 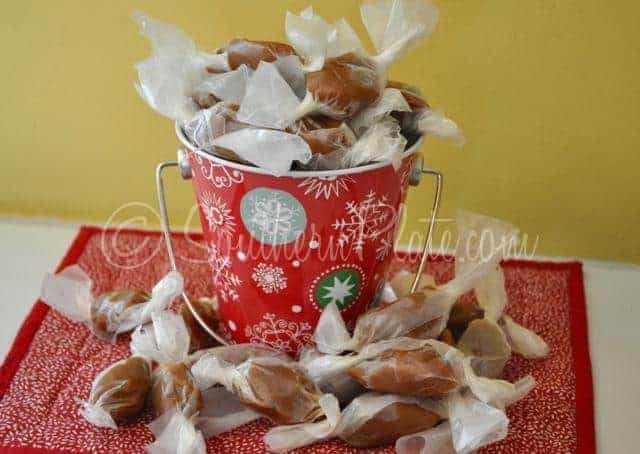 Won't you join me and share with us one of your new recipes, or an old family favorite, you can even throw in a recipe for homemade soaps or detergents (just remember to specify). For the guidelines, you can go here. How about a stunning edible centerpiece for your Christmas Dinner? This one is from Taste of Home and I really want to give it a try. To make it easier, you could buy the prepackaged gingerbread mix then make it and roll it out, cut into stars and bake. 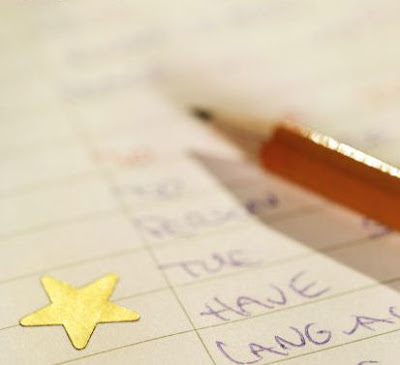 To create star templates: With a pencil and ruler, draw five-pointed stars on sheets of waxed paper, labeling each template with its dimensions. Draw an 8-1/2-in. star, 8-in. star, 7-1/2-in. star, 7-1/4-in. star, 6-3/4-in. star, 6-in. star and 4-1/2-in. star. Cut out with scissors and set aside. To make dough: In a large saucepan over medium heat, bring brown sugar and molasses just to a boil, stirring constantly. Remove from the heat; stir in butter until melted. Stir in eggs until blended. Combine the remaining dough ingredients; stir into brown sugar mixture. Divide dough into four portions. On a lightly floured surface, roll out each portion to 1/4-in. thickness. Using templates, cut one 8-1/2-in. star, two 8-in. stars, one 7-1/2-in. star, two 7-1/4-in. stars, one 6-3/4-in. star, two 6-in. stars and one 4-1/2-in. star. Place on greased baking sheets. Bake at 325° for 12-15 minutes or until set. Remove to wire racks to cool. Cut two circles using a floured 2-1/2-in. round cookie cutter. Cut 12 circles using a floured 2-in. round cookie cutter. Cut two circles using a floured 1-1/2-in. round cookie cutter. Cut remaining dough using floured star-shaped cookie cutters. Reroll scraps. Place on greased baking sheets. Bake at 325° for 10-12 minutes or until set. Remove to wire racks to cool. For one batch of icing: In a large bowl, combine 3-3/4 cups confectioners' sugar, 3 tablespoons meringue powder and 5 tablespoons water; beat on low speed just until combined. Beat on high for 4-5 minutes or until stiff peaks form. Keep icing covered at all times with a damp cloth. If necessary, beat again on high speed to restore texture. To assemble: With icing and round cookies, make six large sandwich cookies and one small sandwich cookie. Let stand for 15 minutes or until set. Place the 8-1/2-in. star on a serving plate. Spread a small amount of icing onto center of star; top with an 8-in. star. Spread a small amount of icing onto center of star; top with a large sandwich cookie. Spread a small amount of icing onto sandwich cookie; top with remaining 8-in. star. Let stand for 15 minutes or until set. Repeat with remaining icing, sandwich cookies and stars, building tree using the largest stars and sandwich cookies first. After each star is added, let stand for 15 minutes or until set. To decorate: Prepare a second batch of icing. Cut a small hole in the corner of a pastry or plastic bag; insert #101 petal tip. Fill bag with icing. Decorate tree as desired with icing, edible glitter and candy. Decorate a 2-in. star cookie as desired; secure on the treetop with icing. 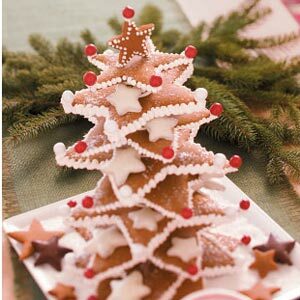 To decorate small star cookies: Dip cookies in melted candy coating; place on waxed paper and let stand until set. Sprinkle white cookies with edible glitter. Leave some cookies plain if desired. 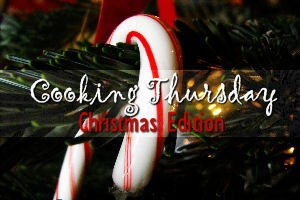 Gently place cookies onto tree branches and on the serving platter. Yield: 1 gingerbread tree and 3 dozen small star cookies. Cloudy and a little chilly. I just wish we had fog again like we did the other morning. Being done with public school....what a relief. Nothing but rest and relaxation. School is on Winter Break and we're done with it anyway, we being homeschooling January 3rd. I find that homemade gifts are appreciated a lot more than some of the bought ones, so I bake and crochet and sew and use whatever other talents I have to make some for the family and friends. Nanna's Blanket over at Bunny Mummy. Oh so many, but the biggest has been that no matter how many times I doubt my ability as a mother, my children always turn around and surprise me and remind me that I HAVE been doing a good job. I've been miserably sick since Saturday morning so the housework has taken a back seat while I recuperate. My wonderful children took it upon themselves to take care of me, feed me and even do the housework while I rest. It's amazing watching them and seeing them repeat and do what I do. Seeing me through their eyes makes me happy. I'm a little under the weather, whatever Nicholas has and half the school had, has been graciously passed onto me and since I never say no to a free gift, well, here I am. Congested, feverish, sore throat and just down in the dumps, which makes it perfect for some much needed down time in order to whip up some handmade Christmas gifts. I've decided to add this little feature to my blog, it's not going to be a daily thing, or even a weekly thing, may not even be a monthly deal, it's just whenever it strikes my fancy. So I've pulled out my hooks and my yarn stash and I'm getting to work, laying in bed with my cup of coffee, my laptop and surrounded by beautiful colors to inspire me. If my kids read my blog, I wouldn't be showing you what I'm making for them, but since they don't it's safe to post. 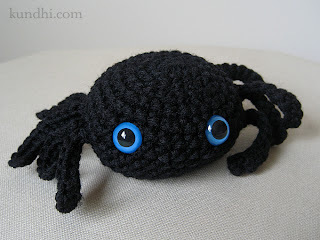 Tiny crochet spider - pattern can be found here at Julie K's blog. 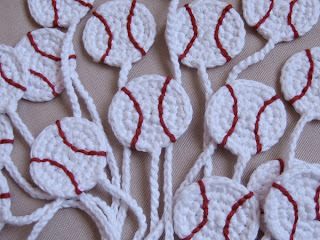 Baseball bookmark - pattern is also from Julie K's blog, it's from her ornament bookmark which I'm using for Jasmine. Tree frog - you can download the pattern here in PDF format. These are all little things to add to his Christmas gifts, I like buying presents but I also like including a few handmade ones and usually my kids appreciate those even more than the rest. 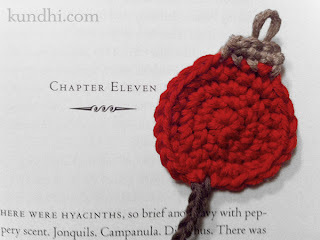 Ornament bookmark - she loves reading and I thought this was just adorable. Pattern Here. 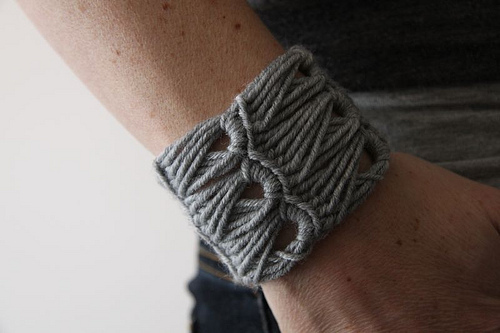 Contortionist Crochet Cuff - she loves stuff like this and I think for a tween girl it's adorable, another great pattern over at Julie K's. 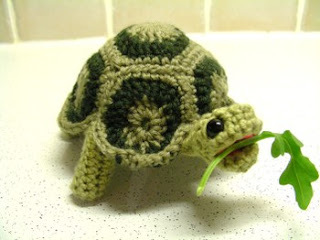 Greek Tortoise - she loves turtles and this one is so cute, you can download the pdf pattern here. 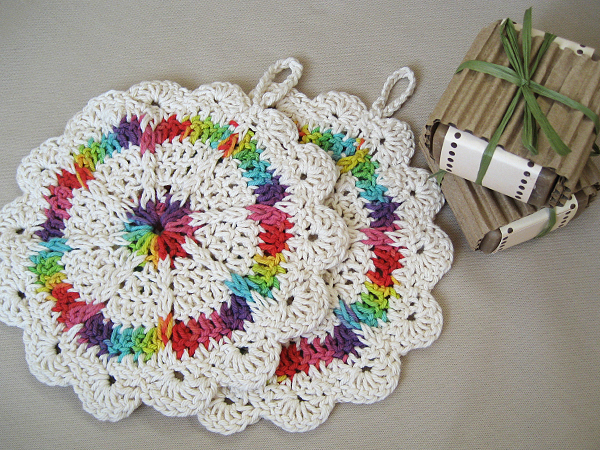 Fire Blossom Wash Cloths - so cute, you can find the pattern free on Ravelry. Crochet Jar covers - I've had my eye on these since I first saw them on Attic 24, but I've tried making one before and it didn't turn out how I wanted it. I'm going to follow Julie's directions and see if I strike gold this time. 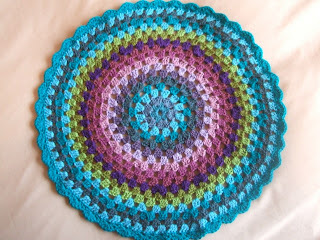 Granny Mandala - I've been looking for this pattern for quite a while and was so happy to find it this morning over at Crochet with Raymond. I can NOT wait to start. As you can see I have quite a few projects to keep me busy today, I just hope I feel well enough to get through them all or at least a few. There's nothing more rewarding than putting the time and effort into making something with your own hands and watching the smiles and joy it brings to the recipient. 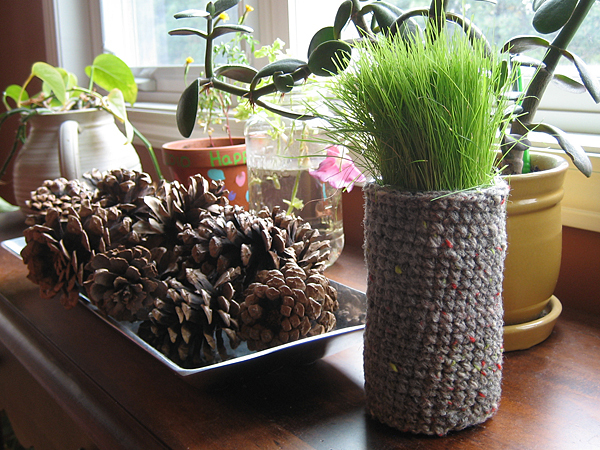 Do you hand make gifts for the holidays too or do you prefer to leave that to others? If you do make your own, what do you make? I would love to hear. SO SO late posting this today. I've been super busy and dealing with sicks kids. So here goes, I've been baking up a storm making goodies to give as gifts and these are being made this afternoon. I have my own recipe but am going to try this one by Southern Plate. Enjoy! Line an eight inch square pan with heavy aluminum foil. Butter foil and set aside. In large sauce pot, place sugar, corn syrup, and butter. Bring to a boil over medium heat, stirring constantly. Boil slowly for four minutes without stirring and then remove from heat. Stir in sweetened condensed milk. Return to medium heat and place candy thermometer in pot. Cook, stirring constantly, until thermometer reads Soft Ball Stage (238 degrees). Remove from heat and stir in vanilla. Pour into prepared pan. Allow to cool until able to handle. Cut into one inch squares and place each square (which will look like a blob at this point) in the center of a wax paper square, roll up and twist ends. When your house is needing attention. When your laundry is piling up. When the dishes threaten to spill over the sink onto the counters. But this little person needs me, needs my full attention. See he is running a fever and not feeling well at all, so he stayed home with mommy and indulged in a plethora of hugs and kisses. It's what he needs and the house will just have to wait. 46 degrees and the sun is shining brightly. Nothing, it's been a crazy time around here and I haven't had the chance to try anything new. Jasmine's Band Concert tonight....Nicholas' Christmas Concert on Friday morning....AND.....Friday being the last day that my kids attend this pathetic school. We all have that drawer or drawers in the kitchen that seem to be the catch all for everything around the house, whether it be pens and pencils, hair accessories, tools, paper clips, scissors etc. I like using the cheap plastic trays you can get at the dollar store to keep everything organized, I can usually fit about 2 or 3 depending on the size into each drawer. Everything looks cleaner and tidier and you can find what you need faster. Haven't done my blog reading yet, I've been awful at it lately. No blog reading, which means no newly discovered blog. Patience and trust in the Lord. With all of this homeschooling change going on, I've had to trust in Him to keep my children safe in that school and to have patience when all I want to do is yank them out that very day. Christmas coming up, I haven't bought a single present yet. Putting my boxing gloves on!